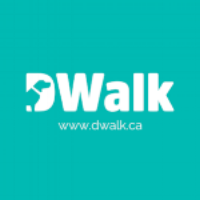 DWalk Is A Vancouver Based Company That Instantly Connects You With Insured And Bonded Dog Walkers And Doggy Care Givers. Download the DWalk App To Connect With A Certified Dog Walker Near You. Your dog is your furry companion and you want him or her to be healthy! A big part of being healthy is getting the dog the exercise that he or she needs on a daily basis. When dog owners think of exercise, they often think of taking the dog for a simple walk. While walking or running is great exercise, there are several options that can foster fun and also build the bond between you and your dog! 1. Take a walk around your neighborhood which is great exercise and also helps with obedience training as the dog will need to be leashed in most areas. Be sure to check your local laws about dog walking. 2. Go to the dog park! If your dog is well behaved with other dogs, the dog park can be a great form of exercise and an excellent way to let your dog interact with other dogs and you can interact with other dog owners. Here, the dog can run free and thoroughly enjoy his or her time outside. In addition, most dogs will play with one another and if you watch, they will start playing their own ‘dog games’ which exert a lot of energy. 3. Play fetch! If you have a backyard, playing fetch is a simple way to get a dog the exercise that they need. You can also play fetch at the dog park if allowed. Fetch is not as taxing to the dog owner, but it will get the dog running, leaping and simply having fun! You can play fetch with balls, ropes or even frisbees. The key is to find which object your dog is going to enjoy better. 4. Swimming! Many dogs love the water, but you will have to decide if your dog is one of these. If you have an outdoor pool, get in and let your dog join you. Exercising in the water is great for dogs with arthritis. And if you don’t have a pool, consider taking your dog to a pond or lake that allows dog to swim. Hint: throwing a ball often helps to get dogs into the water for the first time. 5. Find an agility challenge. Many cities have these set up, especially those super dog friendly cities like Vancouver, Montreal or Toronto. Agility challenges can be anything from a course that tests their agility, along with courses that are meant to work off of a scent challenge. Both of which your dog will enjoy and will get their mind and blood pumping! Why is it so important to ensure that your dog is exercising? This is a must for a healthy dog. Too many dogs are not getting the exercise they need which leads to obesity, and this can lead to other health issues such as heart problems, difficult breathing, arthritis, skin issues and many other issues that can be life threatening. Exercise also ensures the dogs’ mental health, which is just as important as the physical health of a dog. When dogs are not given the exercise that they need, they may become troublemakers. It is not uncommon for a dog who has had no exercise and is staying in the home to start tearing up furniture, having accidents in the home, acting out and so forth. This is all because they are bored and have too much stored-up energy! Remember, if you cannot get your dog the exercise that is needed, a certified dog walker can be of assistance. DWalk has several walkers and sitters near you that can help out in those situations where your dog needs the exercise and you are unable to do this on your own. Newer PostShould I shave my dog in the summer?